KIEV, Ukraine -- People who have closely observed the activities of pro-Kremlin separatist leaders Valeriy Bolotov and Igor Bezler liken their behaviour to gangsters who are prone to criminal activity and violence. Armed separatists guard rebel leaders Valeriy Bolotov (R) and Oleg Tsarev (C) in Luhansk.Pro-Russia leaders in eastern Ukraine conduct themselves as gangsters and solve problems with guns. Andriy Nedovis, deputy of the Luhansk Regional Council, told SETimes that Bolotov engaged in looting and other serious crimes in Luhansk. From April to August, Bolotov was a governor of the self-proclaimed Luhansk People's Republic (LNR). "According to my information, he was the founder of one of the very problematic groups, headed by his former bodyguard with a nickname Ostap," said Nedovis, who met Bolotov on multiple occasions. "They kidnapped people and promised to return them for ransom. But the problem is that when they got the ransom they didn't free captured people." Bolotov was born in Stakhanov, Luhansk region, and served in the Vitebsk Airborne Division. In the 1990s he fought in Nagorno-Karabakh. According to the Security Service of Ukraine, Bolotov had ties with the most important and the richest man in the region, Alexander Efremov, former head of the Party of Regions faction in the Ukrainian Parliament. Bolotov was responsible for gathering money from illegal mines -- criminal skills from the past he used in his leadership position with LNR. "This man made only a very negative impression. I understood that it was better not to talk with him. He is a very narrow-minded person. When you are talking to him he tries to show by any means that you are not interesting to him," Nedovis said. Bolotov disappeared as suddenly as he appeared. In August, he said that because of an injury he resigned his position with the LNR. Bolotov has not been seen in public since then, and well-known Luhansk blogger Sergiy Ivanov told SETimes that he spoke with a separatist in a high position with LNR who said Bolotov was killed when he tried to escape with a few million dollars. "It is an inglorious end. Some of these leaders perhaps will be able to go to Moscow, but for many, especially those who started overplaying, such an end is obvious and very possible, especially in the situation when we don't know what is happening inside gangster groups," Dmytro Levus, director of the Ukrainian Meridian Social Studies Centre, told SETimes. Experts said prominent rebels like Bolotov and Bezler are ideologically and professionally far from becoming true leaders. "All these people are just executors of the Kremlin's will," Ihor Todorov, a professor at Uzhgorod National University, told SETimes. "Obviously, their level of training and professionalism didn't always match customer demands, resulting in the fact that such people were constantly changed or removed. It is unlikely they truly and deeply believed in any ideas." Bezler, known as Bes (Demon), also had conflicts with other terrorists. From the beginning of the military conflict in eastern Ukraine, he and his fighters from the organisation Donbas Militia took control of Horlivka, a large industrial city near Donetsk with a population of 260,000. However, they are not subject to the government of the self-proclaimed People's Republic of Donetsk. 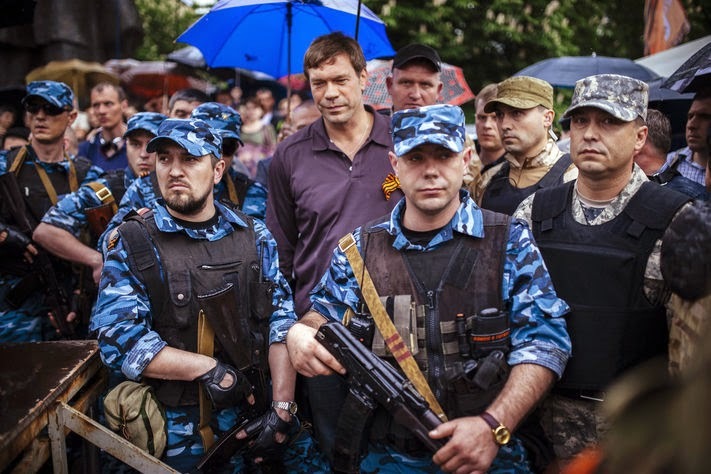 Armed clashes often occur between Bezler's followers and DNR militias. Last week Bezler ordered that the enactment of all documents issued by the DNR be cancelled in Horlivka. "Warlords of terrorist organisations are actively looking for an opportunity to get their own channels of communication with Moscow for targeted assistance from Russia," Dmytro Tumchyk, head of the Centre for Political and Military Studies, wrote on his Facebook page. "Such a channel appeared at the disposal of Igor Bezler, commander of one of the terrorist groups in Horlivka. This caused a conflict with the leadership of the DNR, who seek individual contact with the Russian military leadership." Sergiy Garmash, editor-in-chief of the Donetsk news agency Ostrov, told SETimes that quarrels among the rebel leaders are not new. "They fight each other for a long time," Garmash said. "Most likely, the territory will be simply divided between them. Or the most controllable Moscow-led rat will rule all the processes." According to the Security Service of Ukraine, Bezler was born in Crimea. In the 1990s he served in the Dzerzhinsky Military Academy in Moscow. After that, he worked in the Main Intelligence Directorate of the General Staff of the Russian armed forces. After retiring, he worked in Horlivka as a director of the town cemetery. "He was fired for stealing 38 fences and tombstones, as well as money blackmailed from the elderly for a place in the cemetery," Garmash said. Experts say Bezler remained a Russian military intelligence agent and simply waited for the order to take an action. "He is a person who was left by Russian special services to deeply being settled in Ukraine. He created in Horlivka all these diversionary structures, which then appeared," Levus said. Bezler is one of the most dangerous terrorists, experts said. The Ukrainian Security Service suspects him in the April murder of Volodymyr Rybak, the deputy of Horlivka City Council, who showed a pro-Ukrainian position during riots in Horlivka. In addition, people connected to Bezler's groups claimed responsibility for the May 22nd shooting deaths of 16 Ukrainian soldiers near the town of Volnovaha. Also, the Security Service of Ukraine suspects that people with connections to Bezler were involved in the shooting down of the Malaysian airliner in July. "He does what he was aimed to do after the service in the Russian army: retention and destabilisation of the region," Levus said.